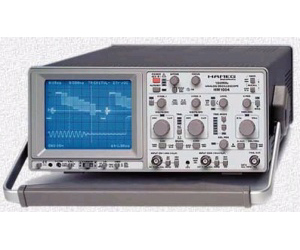 2 x DC to 100MHz, 2 x 1mV/div to 20V/div Time Base A: 0.5s/div to 5ns/div, Time Base B: 20ms/div to 5ns/div Triggering DC to 200MHz, Peak Triggering, Component Tester 1kHz/1MHz Calibrator, TV Sync Separator, Built in Adjustment Menu 9 Save/Recall memories Second time base with the ability to magnify, over 1000 times, extremely small portions of the input signal. The second time base has its own triggering controls, to allow a stable and precisely referenced display of asynchronous or jittery signal segments. The trigger circuit is designed to provide reliable triggering to over 200MHz at signal levels as low as 0.5div. Support period is 10 years.